Ireland’s leading collegiate choral ensemble presents an innovative programme inspired by the evocative natural world in traditional Irish and Scottish folksong and poetry. The waters of the untamed Atlantic Ocean carve out the craggy landscape of Ireland’s western coastline, but it is the ever-varying light—dancing and falling across the land—that gives Ireland unique beauty. The Irish twilight, or ‘half-light’ as William Butler Yeats described it—a mysterious light that stretches out its fingers near to midnight—is particularly enchanting. 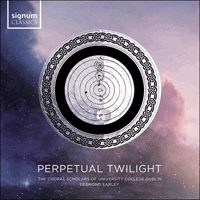 The title of this disk, Perpetual twilight, derives from the phrase ‘perpetuo crepuscolo’ which is drawn from the writings of Galileo Galilei (1564-1642). This Italian phrase is central to a section of the Body of the moon, a work I was commissioned to write for radio broadcast in the Pacific Northwest of the United States of America in 2017. Galileo’s entire phrase ‘we had perpetual twilight and never darkness’ is a poetic description of experiencing the eerie phenomenon of a total solar eclipse. The sun is the source of all our natural light, and sun worship was central to the early spirituality of the Gaels, as it was to many other peoples. Sun-related themes permeate the minds of Irish poets from ancient times to modern: the old Irish poem Aimhirgín asks ‘cé dó is eol ca bhfuineann grian' ('who knows where the sun sets?’); in Elegy, Frank McGuinness writes ‘fetch me the sun and shadow’; Patrick Kavanagh turns our gaze to a star ‘that far vanished flame’; W B Yeats invites the reader to consider the things of ‘night and light and the half-light’ and James Joyce captures the romance of twilight in his poem At that hour when all things have repose. Joyce, a graduate of University College Dublin, is considered one of the fathers of modern literature for his creative brilliance. Joyce was also an accomplished tenor, having won a bronze medal for solo singing in 1904 at the Dublin Feis Ceoil competition. According to a review of the competition in the Irish Daily Independent on 17 May 1904, ‘Mr Joyce showed himself possessed of the finest quality voice of any of those competing’. To mark the unique connection that University College Dublin has with James Joyce, the Arts Council of Ireland supported the commissioning of three pieces for the choir based on poems from Joyce’s 1907 collection, Chamber Music. In addition there is a piece for horn and choir based on a chapter from his seminal work, Ulysses. There are seven new works for choir, each receiving its premiere recording on Perpetual twilight and all of them drawn from the literature of Ireland, together with four new arrangements of much-loved favourites. Many of the texts on this disc express a poetic reflection on the contrasts of light and darkness, and life and death; always in search of a deeper understanding of our place and purpose in this puzzling world. Galileo’s words ‘siamo unite da legami invisibili' ('we are all connected by invisible bonds’) bring to mind our cosmic connectivity. It is my hope that this music will bring a renewed appreciation of the beauty and light of this world, and serve as a reminder of the enduring ties that bind us all together in our shared paths of life. Dúlamán is a traditional working song from the north of Ireland, made famous in the 1970s by the legendary Irish group Clannad. The word ‘dúlamán’ means ‘seaweed’, and the song references two types, one for dyeing and one that is edible. These two types of seaweed also represent two different characters in the song. This arrangement by Desmond Earley features the Irish single-headed frame drum, the bodhrán, and includes a lively refrain that repeats after each verse. Evoking the beauty of the Scottish Highlands, Latvian composer Ēriks Ešenvalds’ arrangement of the well-loved ballad My love is like a red, red rose combines the Irish tin-whistle with a rich choral sound. Despite its resemblance to other ballads of the time, this simple text showcases Robert Burns’ (1759-1796) genius and communicates the deep emotion of eternal love. Commissioned by All Classical Portland radio network to mark the occasion of the total solar eclipse in 2017, Desmond Earley’s piece—based on the texts of Galileo Galilei (1564-1642)—captures the sense of awe fostered by witnessing such a galactic occurrence. Body of the moon was broadcast across the Pacific Northwest of the United States as millions experienced the totality of the solar eclipse. The phenomenon of the eclipse is represented by the lyrical cello line as the choir gives voice to the words of Galileo: ‘Vedere il corpo della luna' ('Behold the body of the moon!’). The bass drum represents the vastness of our solar system, and a lone vocal improvisation speaks to the personal experience of this magical moment. The original pop vocal improvisation was recorded by Erick Vallé, cello by Nancy Ives and bass drum by Chris Whyte with Resonance Ensemble, directed by Katherine FitzGibbon. James Joyce wrote a letter to his brother expressing the hope that his collection of thirty-six poems, Chamber Music, would one day be set to music: ‘The book is in fact a suite of songs and if I were a musician I suppose I should have set them to music myself.’ The first of three texts from Chamber Music featured on this disc, At that hour when all things have repose is set for choir and harp by American composer Timothy Stephens. It is a work filled with musical images: ‘Play on, invisible harps, unto love’. Like many great Irish love songs, The maid of Culmore tells the story of man longing for his absent lover, who has ‘sailed out of Ireland away from Culmore’. He is so forlorn that he wishes a storm would prevent her from emigrating. He searches for her far and wide and his journey leads him to America, where he vows to wander like a pilgrim in search of his love. A star, a poem by Patrick Kavanagh (1904-1967), was set by Natasa Paulberg for the UCD Ad Astra Academy students in 2012. Paulberg, an Australian-Irish composer, illustrates the enormity and beauty of the night sky through her instrumental writing for piano, vibraphone, violin and cello. The glittering stars are represented by piano twinkles, while the melodic line and overall stability of A star is held by the choir, whose singers conjure a sense of reverence as night-time spectators. In 2016, five members of a family died when their car slipped into the Atlantic waters of Lough Swilly from a pier in Buncrana, Co Donegal. The poet Frank McGuinness, born in Buncrana, wrote about the incident, echoing the text of Psalm 137 (‘By the rivers of Buncrana I sat, I did sit and weep.’). Bill Whelan’s sensitive setting allows the listener to experience the anguish and questioning of this tragedy. However, concurrent to the choral repetition of the text ‘fetch me’ appears an angelic solo soprano evoking hope and salvation. Elegy was specially composed for the Choral Scholars of University College Dublin and first performed at the ensemble’s spring concert in Dublin in April 2018. Danny Boy is arguably one of most popular anthems of Irish America, and is often sung at funerals and in remembrance of loved ones. With lyrics penned by the English lawyer and lyricist Frederic Weatherly (1848-1929), the unforgettable melody, the ‘Derry Air’, continues to resonate around the world. Desmond Earley’s evocative arrangement expands from a solitary voice (‘Oh Danny Boy, the pipes, the pipes are calling …’) to the vivid colour of upper voices in close harmony. Expanding to a full a cappella choir and a tenor solo, the work in its entirety reveals a hauntingly intimate expression of this much-loved text. Wild mountain thyme, a Scottish folk song, was popularised by singer Francis McPeake, who recorded it in 1957 for BBC Radio. Bob Dylan’s recording of the song cited it as traditional, with the arranger unknown. Joyce considered the poems from his Chamber Music collection ‘pretty enough to be put to music’ and expressed the hope to his brother that ‘someone will do so, someone that knows old English music, as I like’. The two poems set by English composer Colin Mawby—Strings in the earth and air (I) and Bright cap and streamers (X)—are both imbued with images of music and references to song in particular. The youthful passion of the latter is reflected in the writing for clarinet and choir.